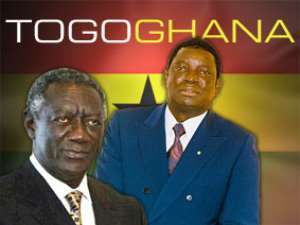 Accra, Feb. 7, GNA - President John Agyekum Kufuor on Monday sent a message of condolence to the Government and people of Togo following the death of President Gnassingbe Eyadema, a statement signed Mr Kwabena Agyepong, the President's Press Secretary, said. President Kufuor said: "We have learnt with profound shock and sadness about the untimely demise of His Excellency General Gnassingbe Eyadema, President of Togo. "On behalf of the Government and the people of Ghana and in my own name, I wish to extended heartfelt condolences to the brotherly people of Togo, especially, the bereaved family. "As we mourn the death of one of the founders of Economic Community of West African States (ECOWAS) and one of the most influential mediators in the Sub-Region, it is our fervent hope that the people of Togo will continue to chart a consistent course in the political and economic governance of their country in consonance with the tenets of democracy, good governance and their Constitution." The message said: "It is through this path that we can ensure peace, stability and sustainable development in our Sub-Region. May the soul of President Gnassingbe Eyadema rest in perfect peace." President Eyadema, Africa's longest serving ruler, died at the age of 69 on Saturday according to a statement released in Lome by the Togolese Government. The statement said President Eyadema died as he was being evacuated for emergency treatment abroad. President Eyadema, a Former Army Sergeant, seized power in 1967 after staging one of Africa's first coups soon after Togo won independence from France.